With the recent pleasant spring weather, I hope many of you have had some time to get outside with your binoculars for a few hours of quality birding! Migrant songbirds have been making their way back to Ohio from warmer, tropical regions for the past several weeks now. Turkey vultures are soaring, Canada geese are nesting and many songbirds can be heard calling as their nesting season gears up. 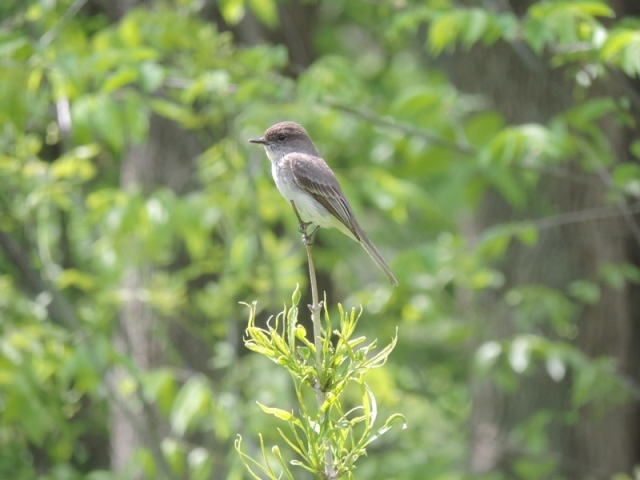 Eastern phoebes, red-winged blackbirds, yellow-rumped warblers, brown thrashers, blue gray gnatcatchers, wood thrush, hooded warblers, and common yellowthroats are just a few of the migrants that have already arrived. This time of year (end of April through the beginning of May) is a fantastic time to see migrating songbirds, especially warblers. May 6th - 15th is the Biggest Week in American Birding and many events are taking place in northwestern Ohio. Visit www.biggestweekinamericanbirding.com for more information. Eastern bluebirds and tree swallows have secured nest boxes in central Ohio, and bluebird eggs have already been laid in some nests. Check out the below picture of a female eastern bluebird busily putting her nest together. She was so intent on the intricate weaving, that I was able to snap several pictures of her without a single pause in her activity. The following picture is the fruit of her labor - a perfectly neat and tidy nest! Ruby-throated hummingbirds have also arrived back in Ohio and are making their way north this very minute. As always, they will be very hungry when they arrive, having traveled thousands of miles. Be sure to have your feeders washed and filled within the next few days, if you don't have them out already! Below is a map, courtesy of www.ebird.org, of our small hummingbird's progression north. You can see that many are still south of us. For more information on bird migrational patterns, visit eBird, an online checklist program available to birders (from the novice to the professional), for recoding bird observations. Visitors can search through the data, tracking when species arrive in certain areas, or where certain species can be viewed. There is also a page dedicated to birding hot spots, which are the best areas to visit to see birds. To track an individual species migration, click on 'Explore Data' then 'Species Maps'. Enter the species, time frame, and part of the world you are interested in to pull up a map (like the one above) of where that species has been spotted. Happy Birding!